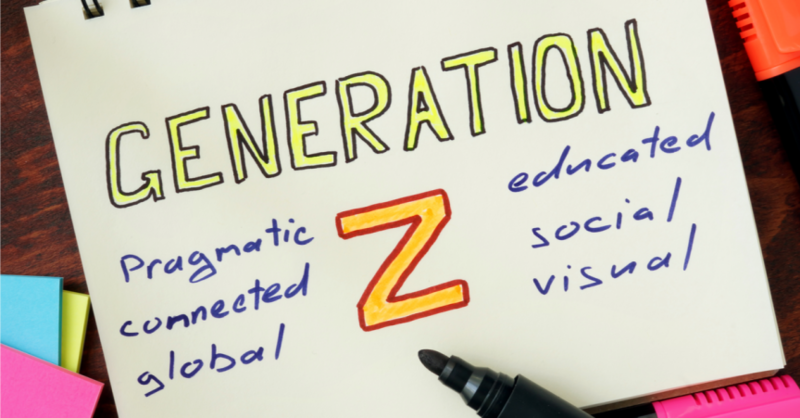 In last month’s blog, Generation Y and Z. What’s Different? 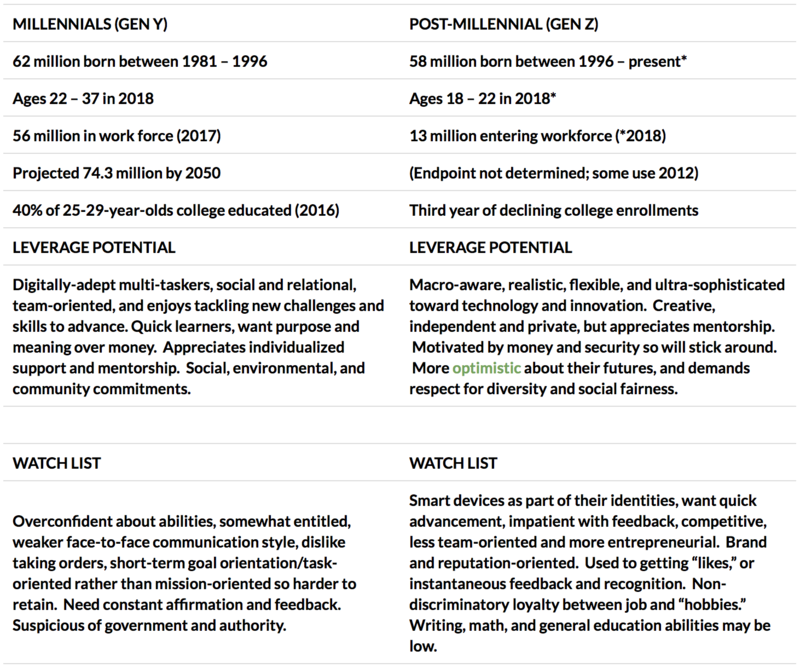 we explored some generalized contrasts between Gen Y workers and the rising Post-Millennials, or Gen Z. [Click Chart] Most of today’s managers are Boomers and Gen Xers, responsible for hiring, retaining, and most importantly, positioning the organization for future growth and success. You need access to the next crop of talented young workers, so now is the time to understand what makes this new generation tick. Today, healthy organizations thoughtfully incorporate generational considerations into their ongoing strategies for innovation, resource, and change management. A business steeped in traditional norms is not likely to keep up with changing times, nor will they be able to leverage skills needed in technology and automation, concepts very familiar to Gen Z. Therefore, if your firm is still stuck in the Baby Boomer model of “it’s my way or the highway,” but ready to make some changes, start with these tips for attracting and leveraging the potential of Gen Z. Hiring the right person for the job has never been more important. Processing invoices all day is not likely to motivate a talented Gen Z to stay for long. With their shorter attention spans, these workers love a dynamic and challenging environment, so anything project-based or technical will excite them and increase their value and retention. Don’t assume that all Gen Z’s fit a specific stereotype. Culture, parenting, and environment all have an impact on personal development. Don’t let generational characteristics alone determine who you recruit. Hire with your staff in mind and select a candidate who may have interests in common. Ask the applicant to provide examples where they’ve succeeded in working with other generations. Check for a dismissive or unenthusiastic mindset about working with others to help determine employability. 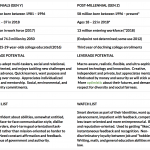 Although Gen Z’s value independence and prefer autonomy to get the job done, they have a lot to learn about collectively achieving a vision. Stress the value of mentorship and offer Gen Z the opportunity to work with experienced employees. Within a bi-directional organizational learning setting, mentorships help in two ways. Younger workers get the direct feedback they crave to help them master tasks (think Yelp), and Gen Z can help boost skills in older workers who sometimes struggle adapting to new technology and software. Make shared learning the goal. Make work relevant. “Because it needs to be done” is no longer a reason to do work. Both Gen Y and Gen Z want tasks to be meaningful, so communicate the big picture for each project. Give Gen Z the tools they prefer to maximize their performance. As “digital natives,” Gen Z works best by connecting through a smart phone or tablet, preferably with video capability. Google Hangouts, Facetime, and Snapchat make face-to-face communication instant and convenient. These techies are acutely aware of privacy and security issues but are not as concerned about trading personal information for features. Set clear boundaries in your technology policies for network usage, downloading, and file sharing. This generation lives online, so communicate information digitally via notifications, training blogs, videos, podcasts, and broadcast texts. According to a Gallup poll, of all the generational cohorts Gen Z is the most entrepreneurial, with 40% wishing to start their own businesses. They like to self-manage but also collaborate, so tap into these strengths through project management. Use coaching and support rather than a directive leadership style and recognize small successes. 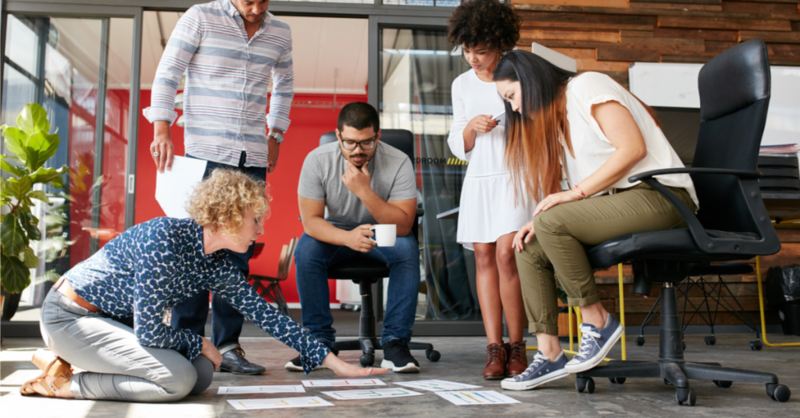 Get managers up to speed on how to create synergistic, micro-communities that feel intrapreneurial as an optimized environment where Gen Z excels and where work can generate the type of excitement needed to get projects done. Environment is important to employee well-being and productivity. Google, Apple, Urban Outfitters, and Pixar are among companies that boost creativity with inspiring workspaces. If making infrastructure investments, consider designing for ergonomics, inspiration, and fun. Because Gen Z’s work to live, not live to work, flexible work hours or paid time off are valued This generation is also less likely to have completed a college education, so educational opportunities, certifications, tuition reimbursement, or college loan repayment assistance are among enticing benefits. There is a lot to love about these promising new workers, and by hiring, mentoring, and retaining this next generation of young intrapreneurs, you will be helping to develop the next generation for the world of work. Contact Partnership Employment today or visit our website to let us help you find specific talent to meet your staffing needs.